I doubt if any Chinese , Japanese and Koreans do not know any thing about soya beans. Some soya bean products such as bean curds are so common that the Chinese name (“Tofu” or “ 豆腐“） have been accepted as an English word. I was once told that Japanese women had one of the lowest breast cancer risk because of their long term consumption of soya beans based products. However, for this post, I did not do a detail research on this. Soya beans have isoflavones that may inhibit the risk of breast cancers and there is an inverse relationship between the intake of isoflavones and miso soup with the risk of breast cancer. (source: Soy, Isoflavones, and Breast Cancer Risk in Japan) . I have to be fair that there are also subsequent, contradictive research studies that rebutted its properties of inhibition and proved that “it may not necessary be able to inhibit the risk of breast cancer…”. Well, just from these two simple conclusions without going into details, in my humble opinion, soya based products are general good and nutritious to your body. If it’s able to inhibit breast cancer, it will definitely a plus point. However, without this property, tofu are packed with vitamins and proteins which are essential for our body growth. There are really many types of soya based products which are used as Chinese cooking ingredients. This post will roughly highlight to you the various common types of soya bean related products in Chinese household cooking. Due the worldwide globalization and improve in communication systems, some of the soya bean related products originated from Japan and Korea are also being accepted by Malaysian and Singapore Chinese households. One good example will be the Miso soya bean paste. 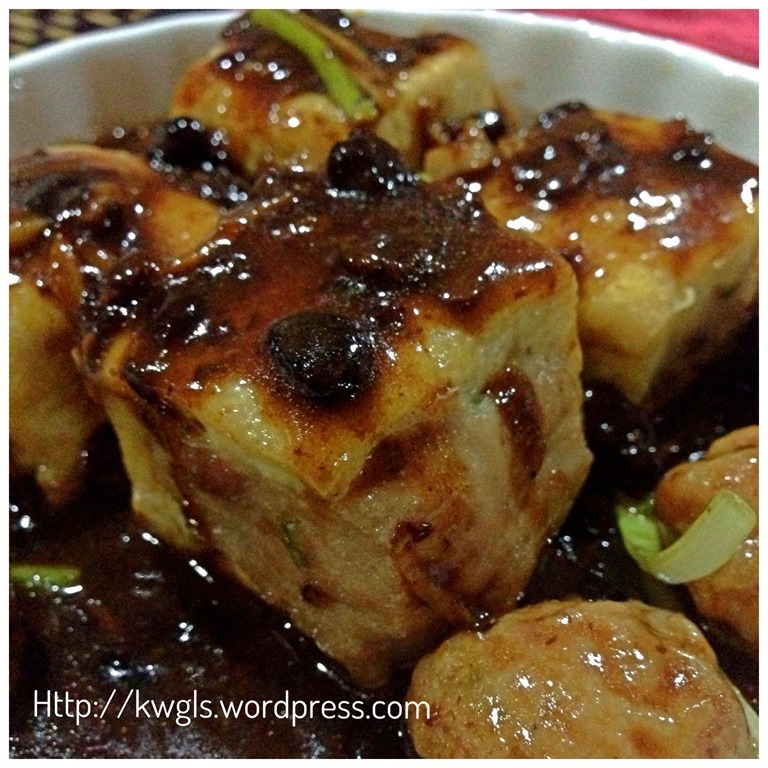 Meat stuffed taukwa and tofu puffs with fermented black bean sauce. 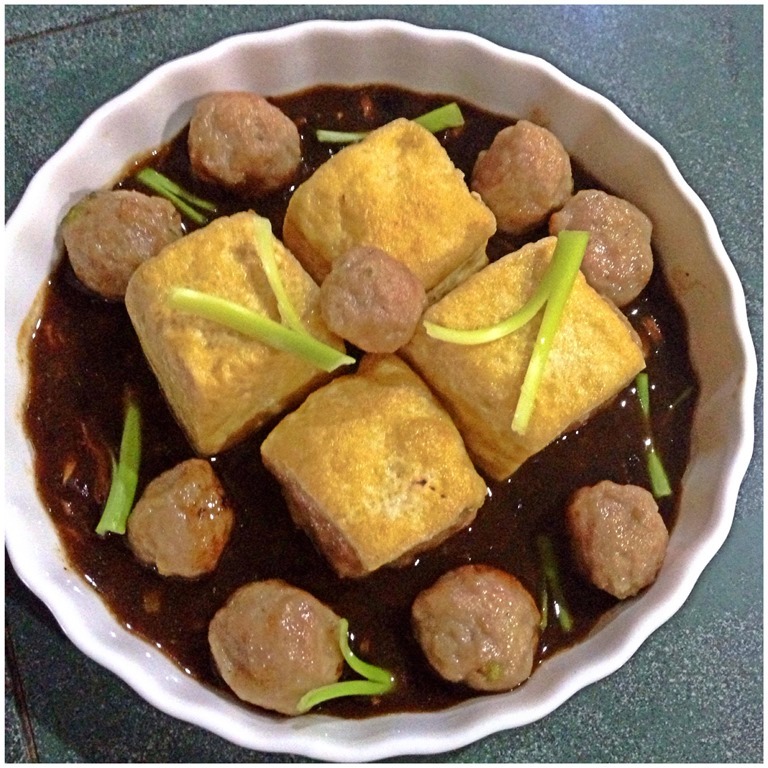 The post will have two recipes – Tofu Puff Meat Balls In Miso Soup and Meat Stuffed Taukwa with Sweet Black Fermented Beans Sauce. In addition, I will refer you to another few recipes that I have written on soya bean products. These recipes will use the following common type of soya beans products. 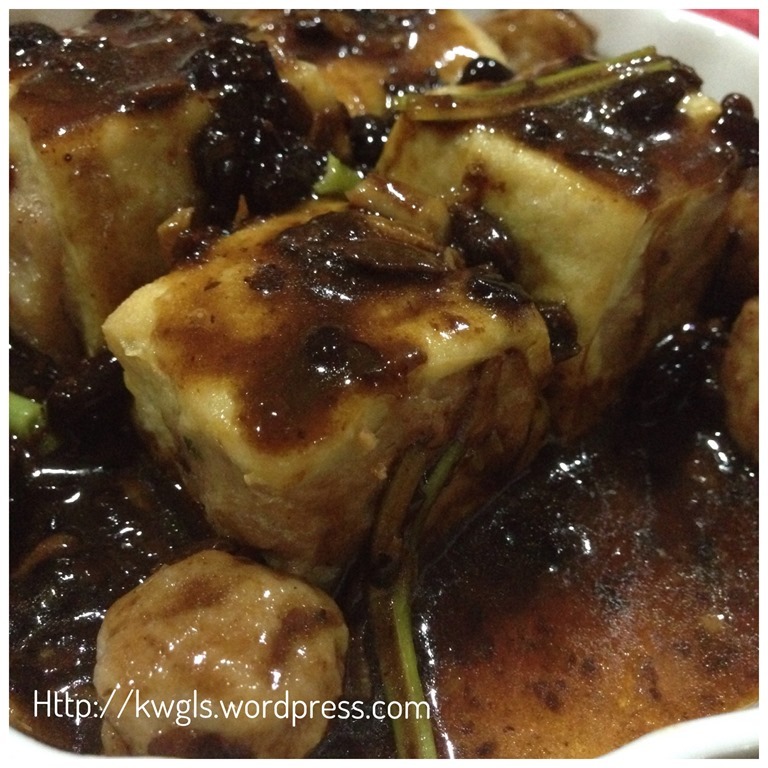 Taukwa – This is also called hard bean curd, a type of tofu that has less moisture content than the normal silky bean curd or tofu. It is firmer and with a meaty texture. It is good for stir frying and deep frying. Chinese black fermented beans – This is a type of fermented soya beans made by fermenting and salting. 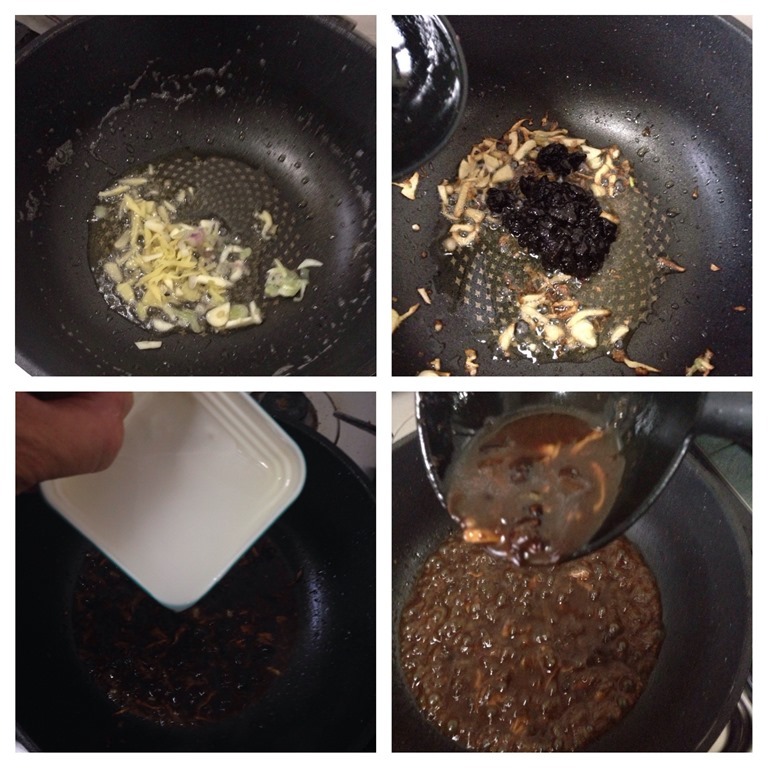 Usually, it is used in Chinese cuisines for flavouring and used in making the black bean sauce (as in the recipe below) for dipping or as toppings. The normal type of Chinese black fermented beans can be slightly spicy and very salty. However, today, the brand I used had a totally different taste. It is a product from Taiwan ROC, sweet and no other condiments are deemed necessary when cooking using these black beans. Japanese Miso pastes – Most will know that Miso is another type of fermented soya bean paste. It is brownish and in a paste form. It is tasty in its unique way and most commonly used in the cooking of Japanese seaweed soup. 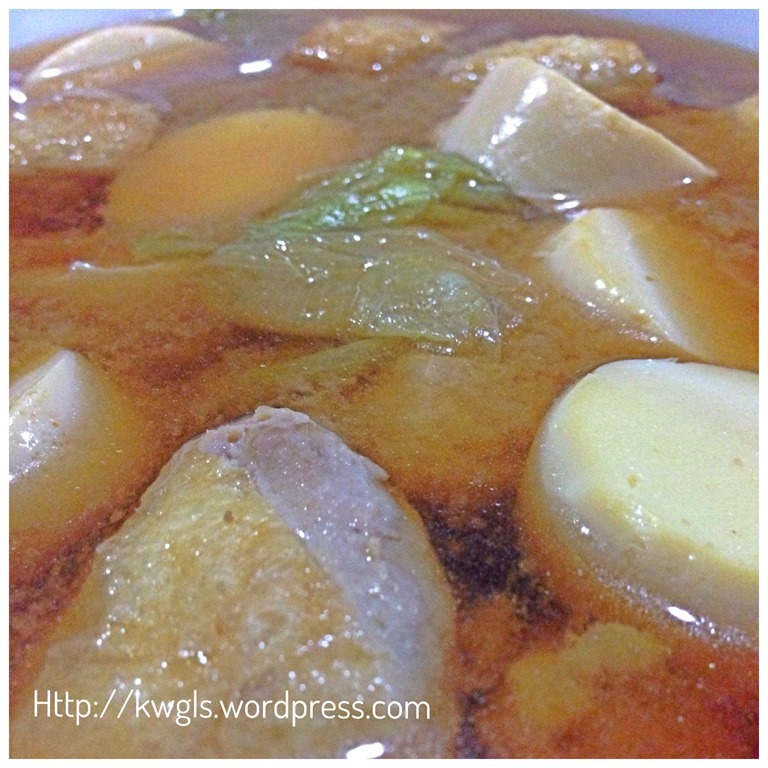 Egg Tofu – Egg tofu is rather common in recent years. It is just like the normal tofu except with the addition of eggs in a certain prescribed ratio. 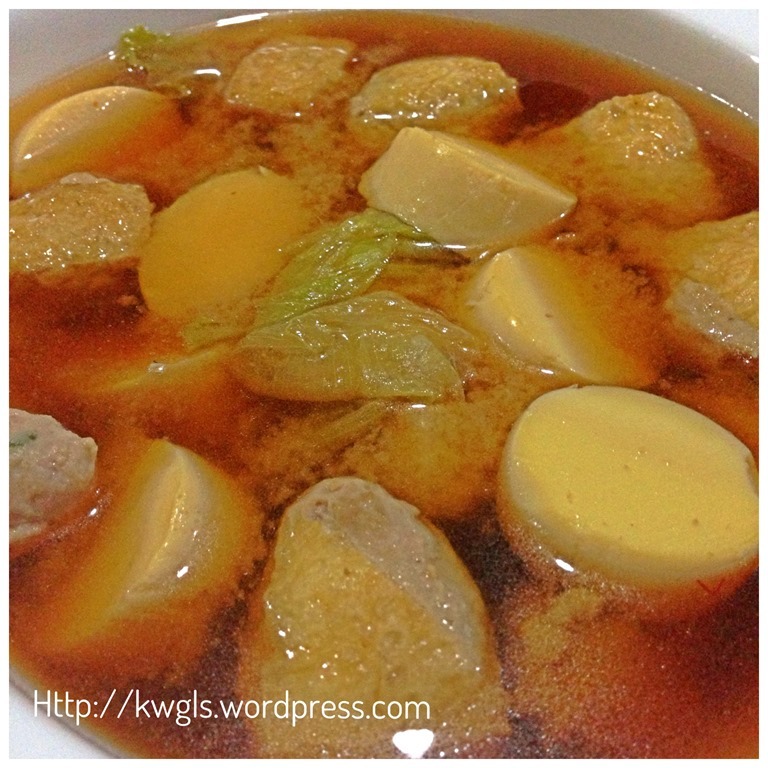 It is soft, full of egg fragrance and one of the well received dishes by kids. 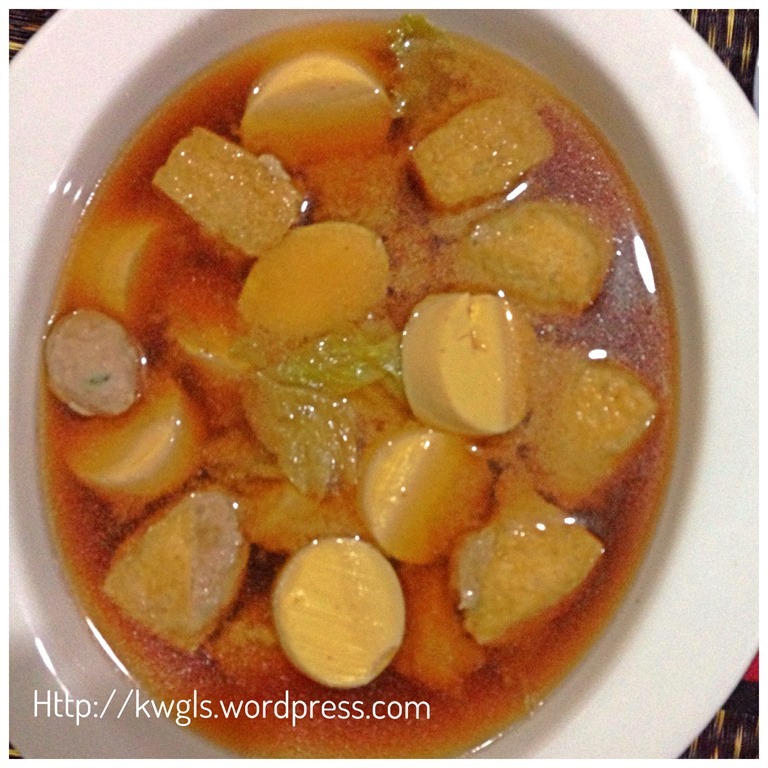 Egg tofu are usually used in soups or some light stir frying dishes due to its silky texture. * Ingredients in these two categories were not in the picture above. In a big bowl, put all the ingredients together (fish meat, corn flour, spring onion, minced meat, sesame oil, white pepper, winter vegetables). 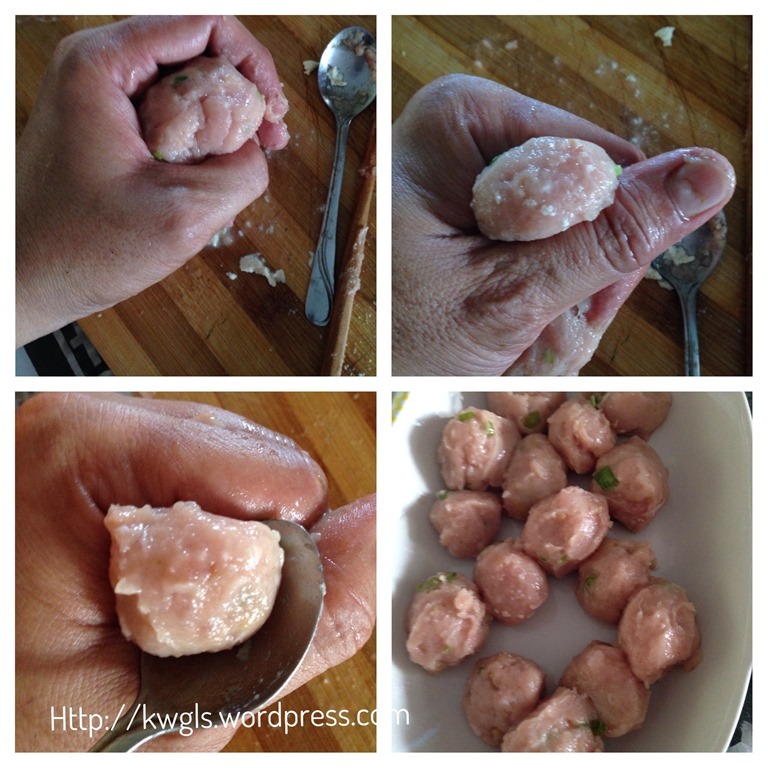 Use a pair of chopsticks or a tablespoon to stir it until well mix. Marinate for 15 minutes. Take a piece of tofu puff. Cut it diagonally into two halves. 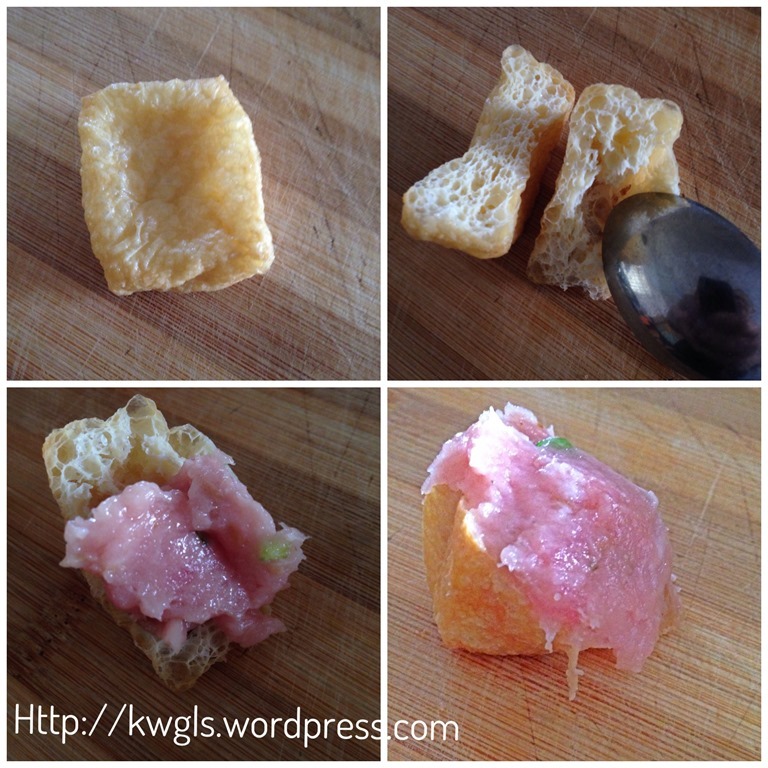 Use a teaspoon to “poke” the centre and make a tofu puff boat. Put 1-2 teaspoons of the marinating meat inside the cavity. Try to stuff as many as possible until it resemble the shape of a volcano (as my kids called it). Set aside and put it in the fridge. Cut the taukwa into 4 smaller pieces. Use a knife to cut the centre a bit, use a tablespoon to dig out a cavity. Stuff as much minced meat as possible inside the taukwa. Set aside and put it in the fridge. 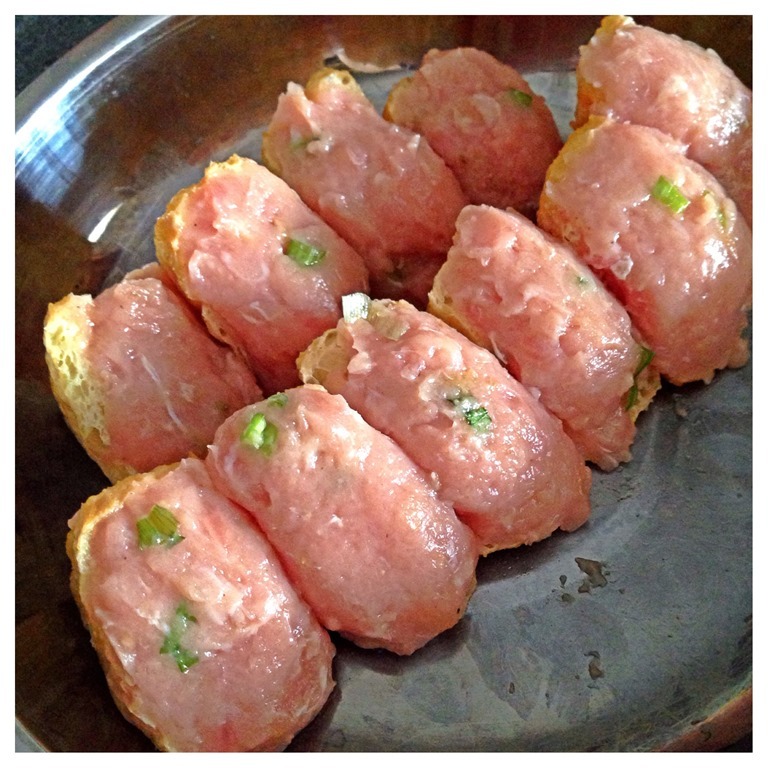 Put some minced meat in your hand. Squeeze until a small ball appeared. Use a teaspoon to scoop out the balls. Set aside for later use. Store in the fridge. If it is too sticky, put some water in your hand and continue. 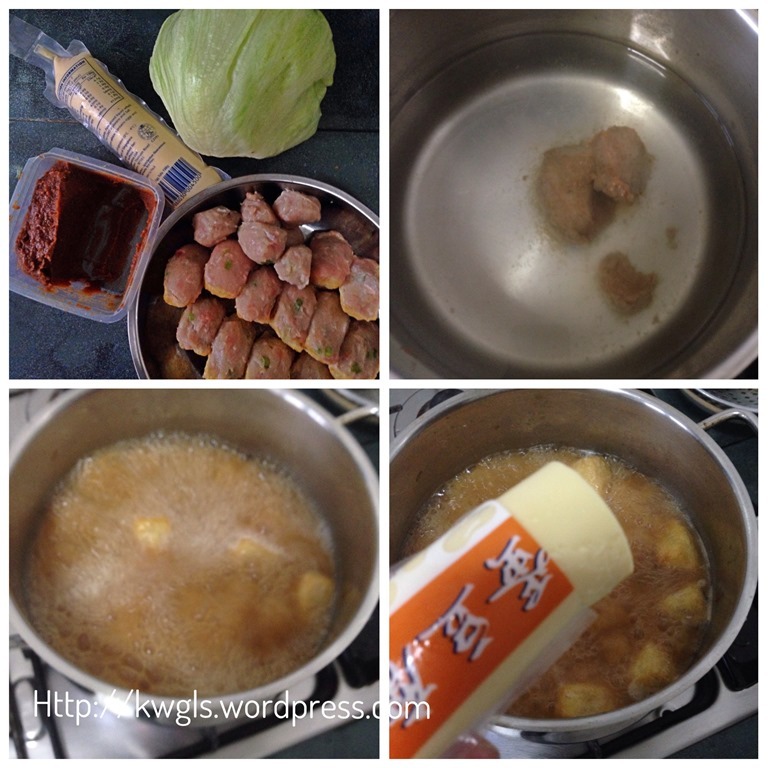 To summarize, for the dish, you should have the tofu puff meat balls, half of the meat balls, some lettuces, 2 tablespoons of miso paste, 1 egg tofu. Bring a pot (about 5 cups) of water to boil under high heat. Add in tofu puff meat balls and meat balls. Let it boiled for about 3-4 minutes. 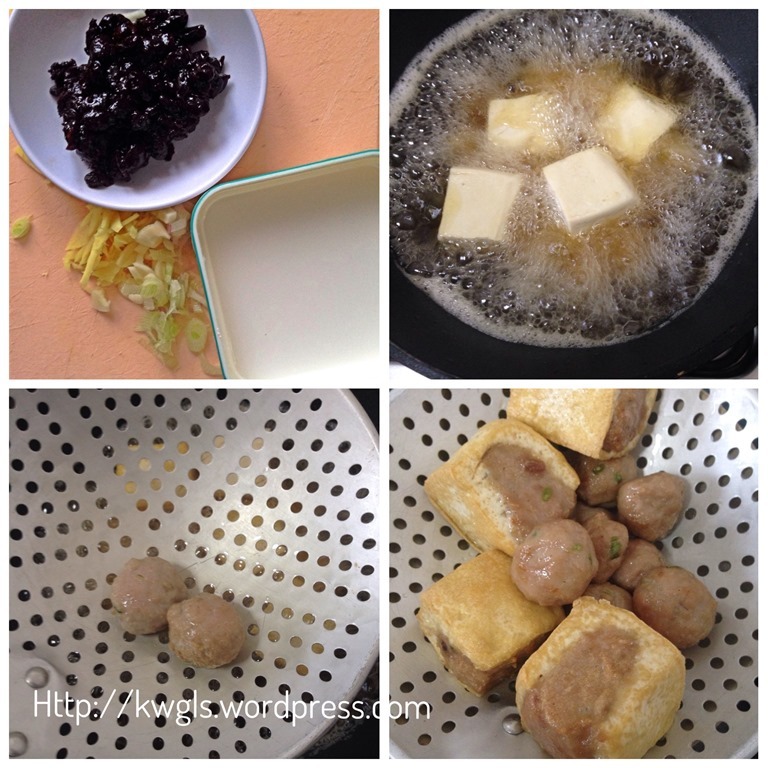 The meat balls will considered to be cooked when it starts to float in the Miso soup. 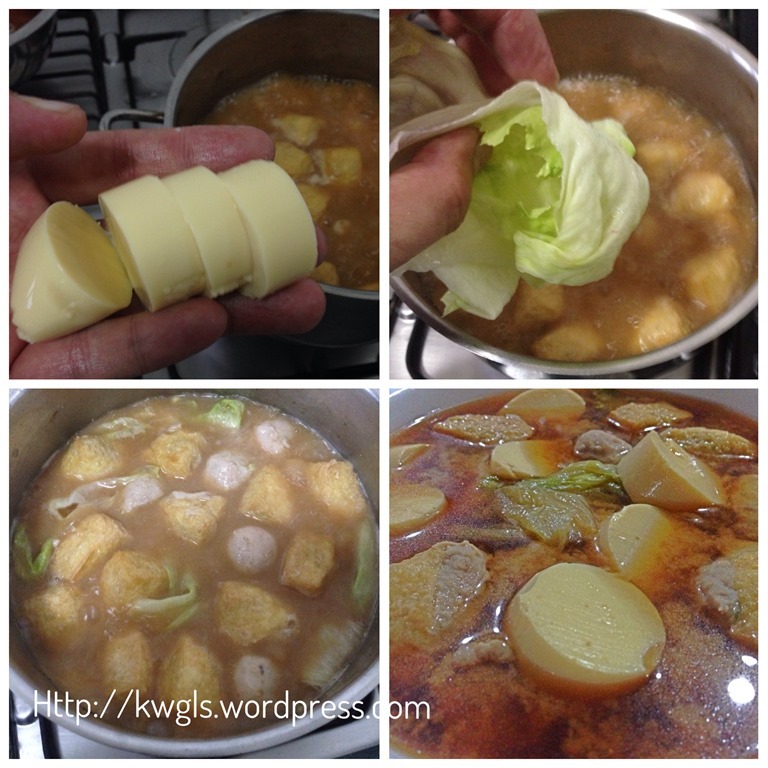 For the egg tofu, cut into small pieces and put in the boiling Miso soup. Add in lettuces and off the heat. No seasoning or condiment is required as the Miso soup is already very tasty. Best served hot as a soup item to go with a full set Chinese meal. To summarize, for the dish, you should have some minced ginger, minced garlics, corn starch solution (1 tablespoon of corn starch in 3 tablespoons of water), 2 tablespoons of sweet black fermented beans, half of the meat balls and the meat stuffed taukwa. In a frying pan, put some oils, heat the oils under high heat. 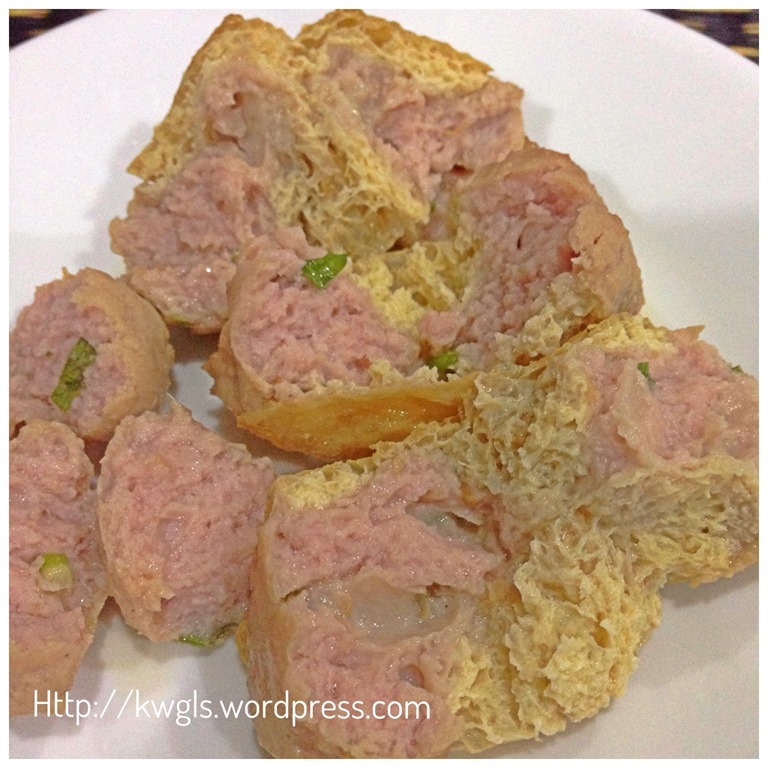 Deep fry the meat stuff taukwa and meat balls until the outer layer is golden in colour. The taukwa may take about 5 minutes but the meat balls will be cooked within 2-3 minutes. Drain and transfer to a serving plate. If you prefer, you can put these in an oil absorbing paper. In the pan, use some oil from deep frying the meat stuffed taukwa, put in minced gingers and garlics, stir fry until aromatic. Add in Chinese fermented black beans, stir fry for 2-3 minutes. Add in half cup of plain water and let it simmer for 1-2 minutes. Slowly add in the corn starch solution. Let it cook for 1-2 minutes or when the sauce is transparent (meaning not milky). Off the heat. Place the fermented black soya sauce on the serving plate. 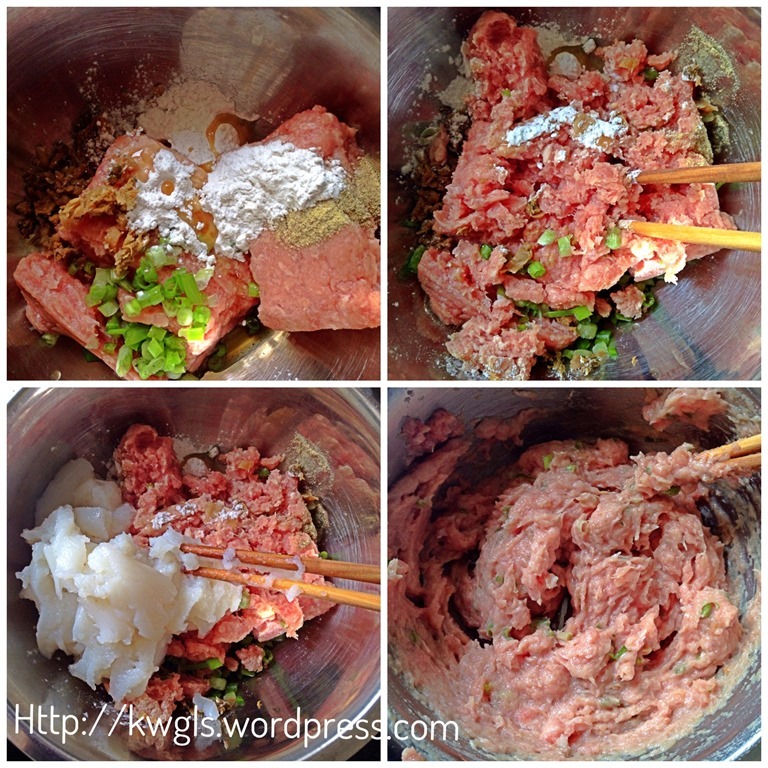 Arrange the meat stuff taukwa and meat ball in the desired pattern. 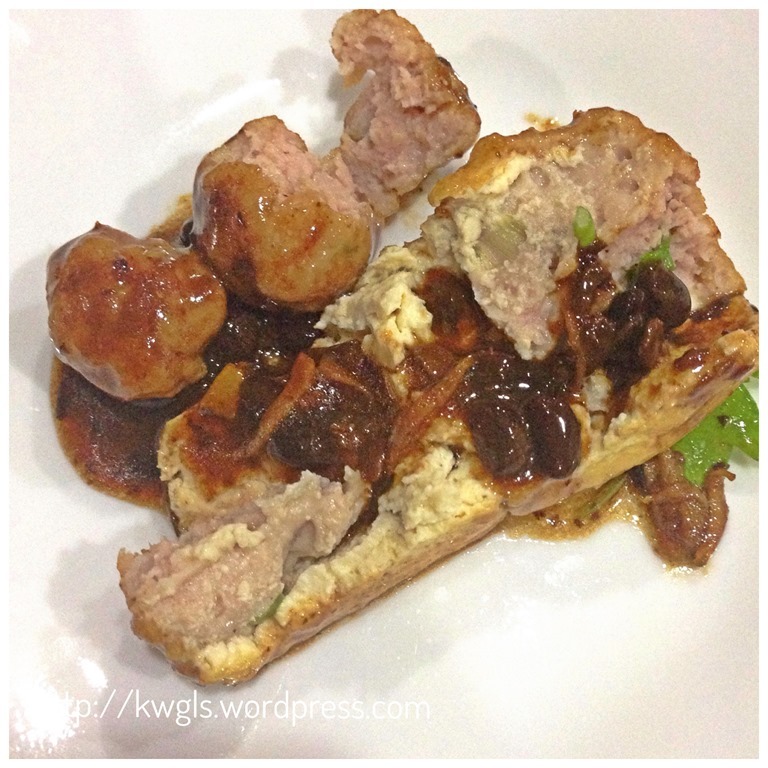 Drizzle some fermented black bean sauce on the top of the meat stuffed taukwa and meatballs. 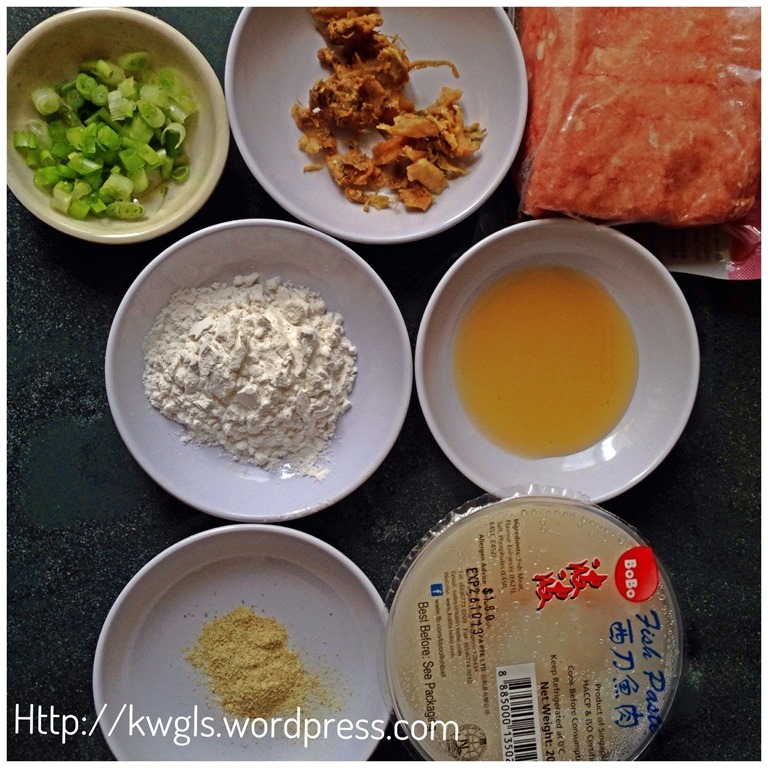 Garnished with some spring onions or coriander leaves before serving. Best served hot as a side dish in a full Chinese meals. Note: If there are no black fermented beans, you can just serve the fried meat stuff taukwa with mayonnaise or Thai sweet chilli sauce, or just oyster sauce alone. 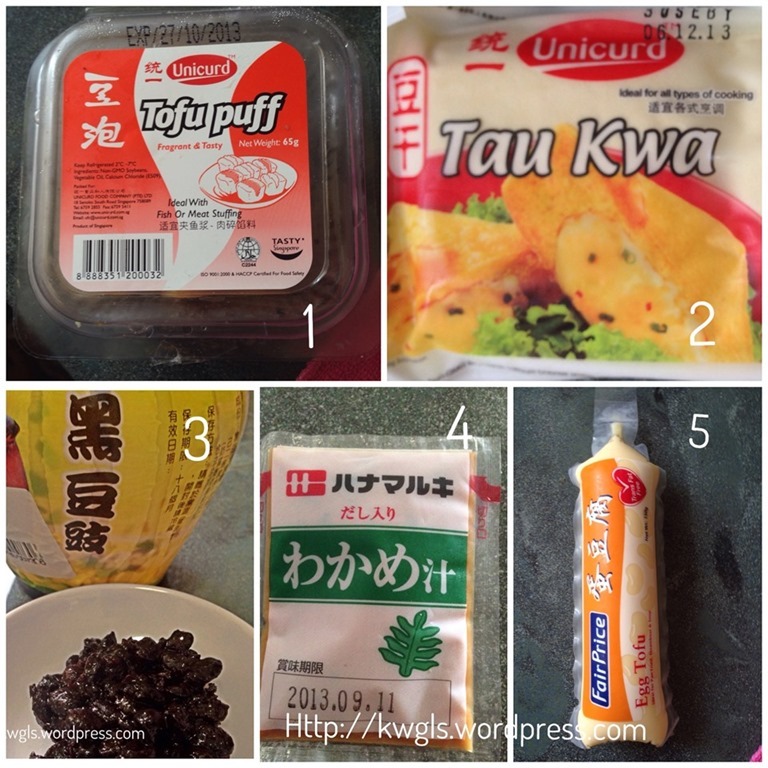 Hopefully for my international readers, you will have a better understanding about tofu and its related products. 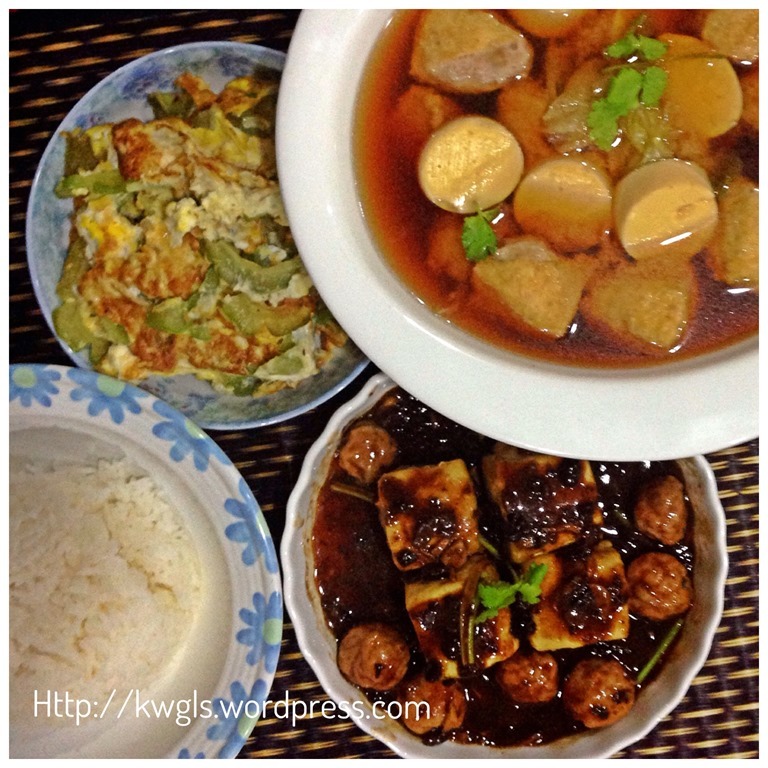 Do try to have some simple tofu dishes at home and I am sure it wouldn’t disappoint you. Hope you like the post today. This post is linked to the event, Little Thumbs up organised by Doreen from my little favourite DIY and Zoe of Bake for Happy Kids, hosted by Mich of Piece of Cake at this post. For Four Seasons Blog Hop where I am the Co-host, please join us for the party where you can get a lot of the family related posts. Please click the above logo to enter your post. 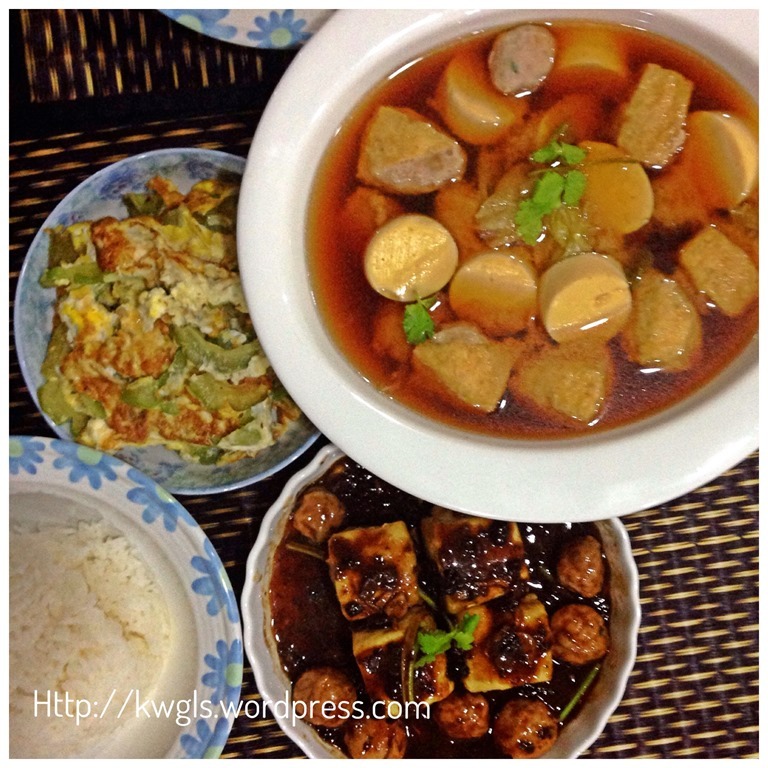 This entry was posted in Dish, Food Preparation Series, Interesting Cooking Ingredients Series and tagged 8, CHINESE, egg tofu, Guaishushu, Miso, miso paste, miso soup, postaday, soy beans, Soya, soybeans, taukwa, Tofu, tofu puffs. Bookmark the permalink. Thank you for this. I have’nt ever seen the Tofu Puffs here in the UK, but I will look for them now. 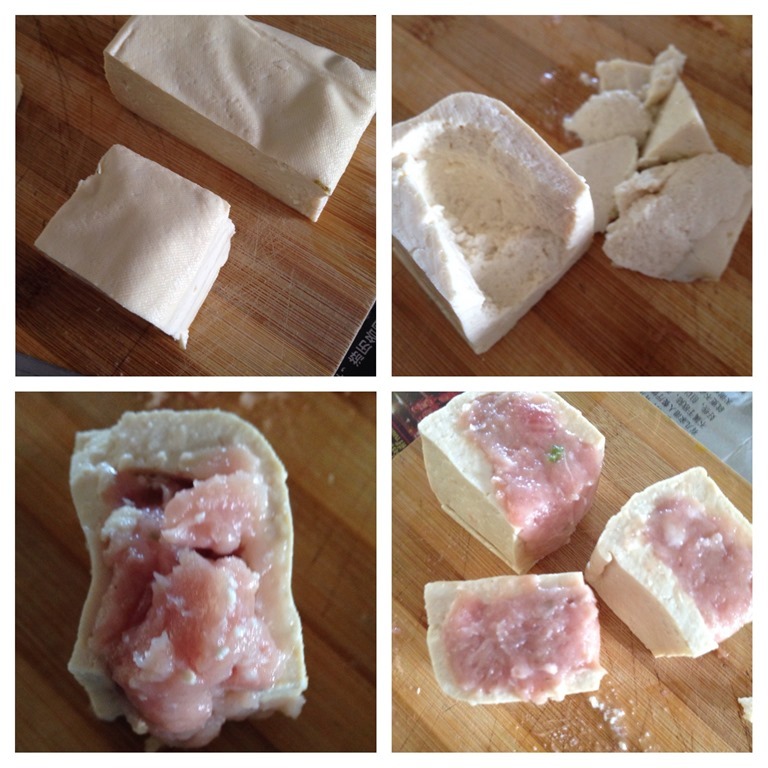 I also had not seen stuffed tofu before like that – I will certainly try it! I see that you have two very hardworking little helpers making your stuffed taw kua. Lucky you! Are you “paying” with a delicious tofu meal? Ken I appreciate you linking this post to my Tofu party. I knew there were a lot of products but I had no idea there were *that* many! I’ve seen a Soya soda too (maybe it’s Korean?) .